There is nothing wrong with a succulent Christmas ham, but we’re traditionalists: on December 25th, nothing but turkey will do. Preparing the perfect turkey for Christmas can seem like a daunting task, especially when friends and relatives are coming over on the big day. However, here are five tips to help make this noble goal that much simpler. It’s simple to just visit your local grocery store and grab a frozen turkey. However, while fresh requires more planning, these birds retain more of their original flavour. Even the higher end frozen turkeys lose a bit of their taste. Also, when you think about it, they’re not as handy as you might expect. You must prepare to spend at least 24 hours defrosting a frozen turkey. These birds are also more likely to have been factory farmed, which may clash with the values of some of your guests. Fresh turkeys are often free-range or organic, meaning they did not spend their entire lives in a barn. Free-range turkeys graze on a wider variety of food than their factory farm counterparts, while organic turkeys receive only an organically grown diet. These birds are also the most likely to be free of antibiotics. Turkey connoisseurs usually feel the natural diet (vs the corn feed given to factory birds) results in a sweeter taste, as well as a more appealing texture. That said, be prepared to pay more for free-range and organic turkeys. No matter whether your bird is fresh or frozen, it’s very important that it is room temperature before going into the oven. 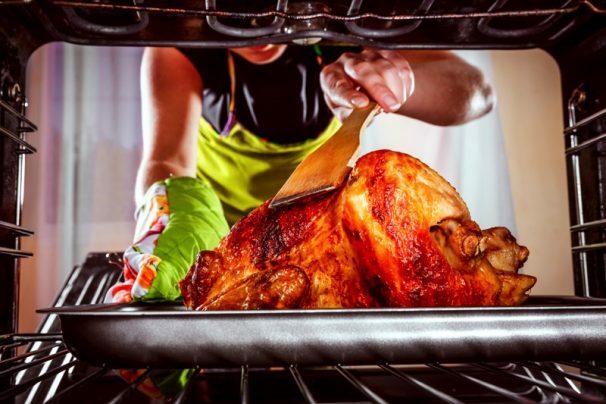 With a consistent starting temperature throughout the turkey, the heat distributes evenly, ensuring proper cooking. Make sure you put the bird in the oven with enough time for it to cook at the recommended temperature. The larger the turkey, the more time you will need. Stuffed birds usually take 15 minutes per pound, while those without stuffing are 12 to 15 minutes per pound. If you are late getting the bird started, you can try raising the heat. However, you risk the turkey drying out. It’s better to play it safe and delay the start of dinner. There is no such thing as over basting a turkey. One of the primary complaints people have about roast turkey is that it can be too dry. Baste your bird at least every 30 minutes and eliminate this worry. This step is not as crucial for so-called self-basting turkeys. During the processing stage, an injection of saline solution into these birds helps to maintain the moisture level. However, this process can alter the taste of the meat, so if you’re a purist, this is not the advisable choice. Self-basting turkeys also tend to originate from factory farm operations. Nothing is more disappointing than having parts of the bird overcooked or undercooked. In addition to tip #2 above, you can help to prevent this by using a meat thermometer inserted into the thickest section of the turkey. Try to maintain a temperature of 74 °C (or 165 °F). This minimum temperature ensures that the meat is properly cooked and safe to eat. Upon completion of the cooking time, take the bird out of the oven and let it sit on your stovetop for 20 minutes. This allows the turkey to reabsorb its juices, resulting in tender meat and enhanced flavour.